Much of this year’s Ross Video booth set-up was powered by Adder Technology’s innovative KVM products. With 60 discreet workstations being fed by 75 computers and PCs, Ross Video implemented five ADDERView DDX30 KVM matrix switch systems to ensure that attendees could enjoy the best possible experience when they visited the booth. With the DDX systems in place, Ross Video was able to easily switch between and control the numerous computers required to demonstrate the breadth of features Ross Video’s own products offer. “This year we had one of our most challenging and complex booth setups at the NAB show, and Adder’s solutions played a critical role in helping us deliver the best possible visitor experience. We wanted to give attendees hands-on experience with our latest products and the chance to see their capabilities up close; the DDX systems from Adder definitely made this task a lot easier and smoother.” says Stuart Russell, Ross Video’s EMEA Marketing Manager. 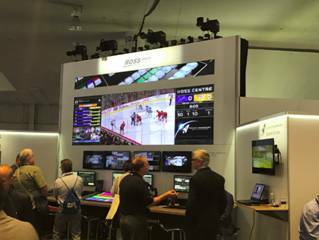 “We were only too happy to have Ross Video use our products for demonstrations at this year’s NAB show. We were extremely impressed with the company’s plan for its booth, and our products were the ideal solution to help them overcome the hurdles they faced along the way. We can guarantee that those in attendance at the Ross Video booth would have been blown away.” says Caleb Hooper, Vice President of Business Development and Product Marketing, Adder Technology.